The Windham High JV Volleyball team came out strong on the Thursday, September 21 game in the first set with Katelyn Smith (#5) scoring multiple points and Mollie Simonson (#22) scoring two points. Additional scorers for Windham in the first set were Julia Freire (#14), Ellen Files (#6) and Hayleigh Moody (#26). Windham had several good volleys resulting in multiple points, but at the end of the first set Massabesic was able to squeak by, winning 25-21. In the second set, Windham was altogether aggressive with excellent teamwork and communication. Points were scored by Katelyn Smith, Ellen Files, Sarah Elder (#12) and Julia Freire. Windham got it done winning the second set 25-19. A tense third set started out a little slow for Windham, but the girls came back with great volleying and communication to close the gap between them and Massabesic. Ellen Files scored multiple times in the third set. Sarah Elder scored after an assist from Brooklynn Bracket (#7). The girls played a very solid game, but lost the third set 15-12. The varsity girls had a powerful start to their game against Massabesic as well. The first set consisted of Morgan Proulx (#23) and Danielle Hall (#13) scoring multiple times. Other scorers included Grace Schmader (#16) and Lydia Budroe (#4). Windham had excellent teamwork and volleys in the first set resulting in a win 25-18 over Massabesic. 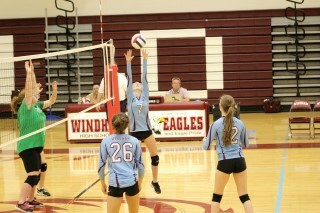 Windham came out just as forceful in the second set. Grace Schmader and Megan Fleck (#20) scored multiple times. Other scorers included Danielle Hall and Lydia Budroe. Windham continued their winning streak with a 25-20 win. The third set was another tense one for Windham with Massabesic giving it their all. The two teams were neck and neck for most of the third set. Meghan Harmon (#35) and Julia Hills (#10) both scored multiple times. Windham had excellent teamwork and communicated well with each other. After an exciting third set, Windham clinched the win 25-20.